Unfortunately this means that despite spending time KNITTING one a day, I have frogged all but one of the 'puffs...which I then stuffed with too little filling so is probably not useable anyway! Therefore, this week is officially being declared a One a Day write-off! I hope to bring you better news next Tuesday. In the meantime, don't forget to check out the other projects via Carole's blog. The Addis are fabulous actually, they seem significantly thinner and more flexible than the KnitPros circulars which is why I ended up with the laddering problem - all my previous 'magic looping' has been fine - you know those knitpro cables are self-tangling, right? - but with these you have to twist them to ensure there isn't a ladder up the side. (There are pics linked from Pretty Made's comment the previous post about the ladders) They are very sharp & pointy (ouchily so!) and apart from the metallic smell they are very nice to use. Perfect for the sock yarn I'm using on these puffs. Oh no! Wishing you better luck on puff progress this week! Hope your puffs come out better. 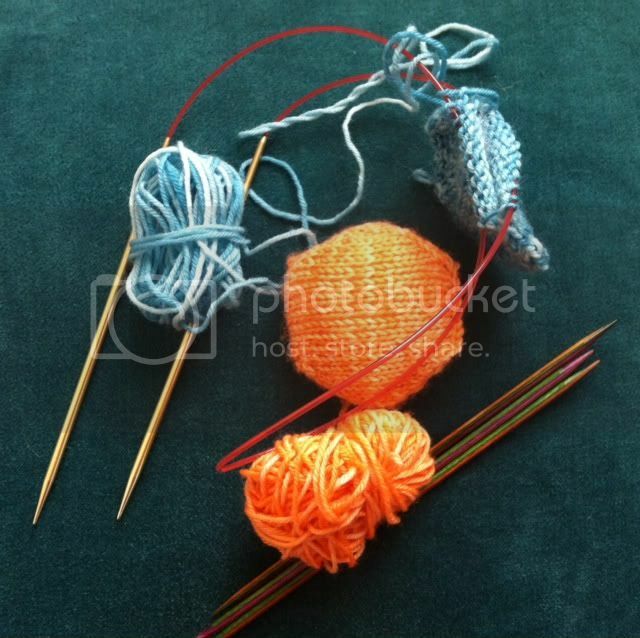 Love the orange yarn, very pretty. Have a great day! Oh dear, I'm glad you managed to solve the ladder problem. Hopefully now you've ironed out the teething issues with the new needles next week you will be back to normal. I did the same with this pair of socks, knitted them, frogged them, knitted them again, frogged them, rinse and repeat. Eventually I found a different pattern. Hopefully your hexipuffs will behave from now on. Oh dear that's so disappointing. Fingers crossed next week will go better and all puffs will behave themselves. Looking forward to seeing next weeks progress. You're so brave to try knitting w/out looking. I just can't do it. Naughty, naughty puffs! Just as well they are beautiful or you would have banished them by now. I don't consider it a write off. You learned so much!! That time counts! Here's hoping for a bumper week now that you've climbed several learning curves in a few short days! It was worth the try, I'll be at my puffing too this week. I have been a bit occupied with a bigger project of TOK :-). 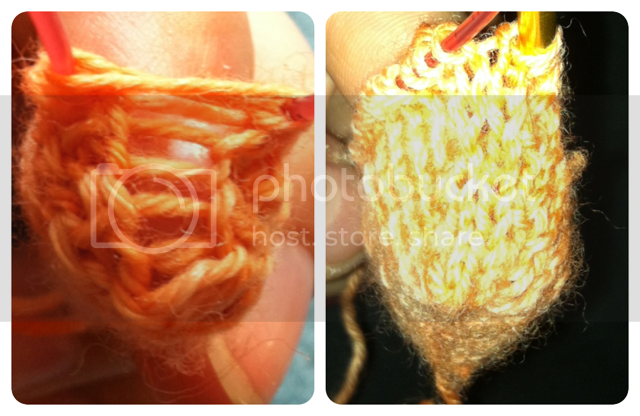 I love that sunny orange yarn. Thanks for sharing your hexipuff problems - I'd like to try them sometime soon and all this extra info is really helpful.